If you are looking for selling your valuable gold jewels and items then visit us in Delhi NCR to get the best cash for gold. This service has been renowned internationally to facilitate instant cash in exchange for old used/unused jewelry. Once you go through the process of the sell you would be asked details of your valuables that you wish to sell. In respect to that, always carry a description paper or an original invoice to show that your valuables are in the right shape you have acclaimed last. To sell ones jewelry, there are plenty of buyers in the market even the pawnbrokers would ask to sell to the valuables easily, but how much they are responsive to that is what one have to understand. Also, there are banks, there are jewelers who offer the same services but in a different means. Those means might not co-inside with your requirements. Hence, here are we, trying our best to guide you to an ultimate solution to get you what you are looking for. 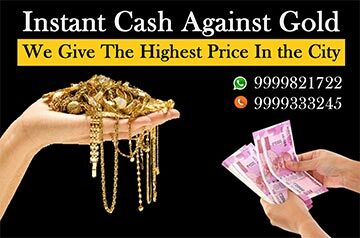 We at Gold For Cash is the most renowned and leading gold buying market in Delhi NCR. We have our service established in all the small neighbourhoods in Delhi NCR. We are an experienced team of precious metal dealer. Our services start with our online platform, where one can easily read and know about us and also contact our dealers to get an easy process of selling. Once we receive a response or notification from our customer’s end, we will contact our valuable clients in person and offer the best service possible. Our team of buyers is experienced from over 20 years with the same practice and offer to buy precious gems and jewels of all forms and of any value. With us, we will provide home pick up service with zero charges for a distance radius of 45 KMs from our nearest location. Not only that, but we also offer free overall services from free gold evaluation in the German Keratometer to testing and verifying the articles. All the details are checked by our jewelry experts and also verified by our latest international technologies. In not more than 15 minutes, we will offer you the quote. Our quotes are free of charge and also the best quotes from any other jewelry buyer in the entire territory. Selling gold is not as tough as anyone has been imagining. Sell your second hand or used jewelry who look for buying them like a second-hand jewelry market like ours. We are the most leading second-hand jewelry buying market in the entire Delhi NCR. Starting from Noida to Gurgaon we have established more than 20 outlets to cover your immediate finance attention including Faridabad and Ghaziabad. If you are looking for the right place with the right people inside for your jewels to offer you the highest price ahead, visit us online or also visit us in person. To reach our head office, visit us at Shop No-109, first floor, P-6, Ocean Complex, Sector 18, Noida, UP - 201301(India). 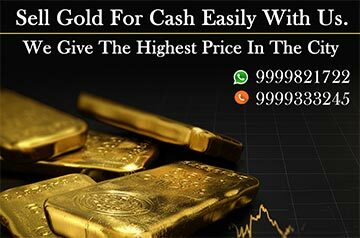 If you are in Delhi and looking for the nearest option for selling your valuables, then search for cash for gold near me. You can easily find us in most renowned places like Arjun Nagar, Laxmi Nagar, Green Park and many more. We buy all form of yellow precious metals like bars, bullion, coins, bars, scrap, used or unused and even broken jewelry. Our experienced gold buyers value the items as per their quantity and quality. For quality, the purity has been accounted for as per the article. Once the jewelry is checked and verified, a quote is offered in an insistence. In no time, we offer the best services that other jewelry buyers are unable to offer. Also, we offer instant cash of any high amount required. If the client responses for another medium of traction, we do that as well. Our main concern is to build the trust and valuable bond as we do not hope to profit from the jewelry but from our valuable bonds, that we make in the end. To know more about our services, read the testimonials mentioned by our clients after their deals. In jewelry, we buy Rings, Bracelets, Anklets, Pendant, Necklace, Earrings. Having more than two decades of experience in the sphere of jewellery purchasing, we here at Gold For Cash are listed as an exclusive buyer of Gold, Silver, Platinum and Diamond. Visit us today for getting exclusive Gold buying deals only from Us. Copyrights © 2018, www.goldforcash.co.in. All Rights Reserved.